A "Permission denied" error means that the server rejected your connection. There could be several reasons why, and the most common examples are explained below. Should the sudo command be used with Git? You should not be using the sudo command with Git. If you have a very good reason you must use sudo, then ensure you are using it with every command (it's probably just better to use su to get a shell as root at that point). If you generate SSH keys without sudo and then try to use a command like sudo git push, you won't be using the same keys that you generated. Typing is hard, we all know it. Pay attention to what you type; you won't be able to connect to "githib.com" or "guthub.com". In some cases, a corporate network may cause issues resolving the DNS record as well. debug1: Connecting to hostname [IP ADDRESS] port 22. The connection should be made on port 22. If your connection failed and you're using a remote URL with your GitHub Enterprise username, you can change the remote URL to use the "git" user. The ssh-add command should print out a long string of numbers and letters. If it does not print anything, you will need to generate a new SSH key and associate it with GitHub Enterprise. Tip: On most systems the default private keys (~/.ssh/id_rsa, ~/.ssh/id_dsa and ~/.ssh/identity) are automatically added to the SSH authentication agent. You shouldn't need to run ssh-add path/to/key unless you override the file name when you generate a key. You must provide your public key to GitHub Enterprise to establish a secure connection. Start SSH agent in the background. Compare the list of SSH keys with the output from the ssh-add command. 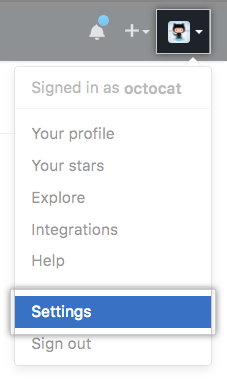 If you don't see your public key in GitHub Enterprise, you'll need to add your SSH key to GitHub Enterprise to associate it with your computer. Warning: If you see an SSH key you're not familiar with on GitHub Enterprise, delete it immediately and contact your GitHub Enterprise site administrator, for further help. An unidentified public key may indicate a possible security concern. For more information, see "Reviewing your SSH keys."